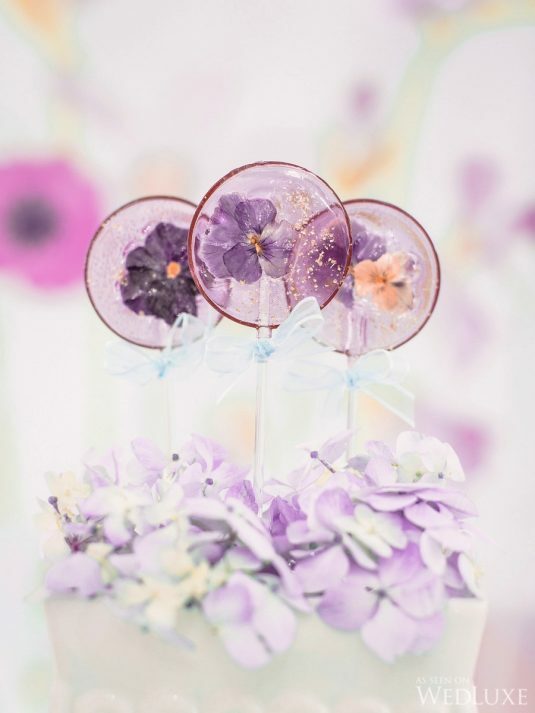 This styled shoot features an ice cream-coloured palette to complement the world of plants and wildflowers which provided poet, Emily Dickinson, with a constant source of inspiration and companionship. Glaze and John Events produced the “Poetry of Flowers” editorial, which can be seen in our “Literary Love” issue on newsstands now, working with an elite team of Toronto-based creative professionals. Paper & Poste designed a custom watercolour-inspired floral motif that was incorporated throughout the shoot, from a stationery suite displayed with matching pastel-coloured chocolates adorned with flecks of gold to a large-scale backdrop produced by Event Graffiti. The tablescape was designed with a summer wedding in mind, our team was particularly taken with the Pinterest-worthy upside down ice cream cones from Nadia & Co~ that function as place cards. Nadia & Co~ also created an exquisite cake with hand-painted flowers for the shoot and lollipops with edible fleurs, while Sweet Sammies Ice Cream Sandwich Co. designed a colourful plated dessert along with striped ice pops and slushies —a perfect cold treat after a sun-soaked ceremony or long night of dancing! Artiese Studios was on hand to beautifully capture all of the details on location at Berkeley Fieldhouse. You can learn more about the shoot, including the Emily Dickinson poems that speak to the different elements, in our Summer/Fall 2015 issue (Eastern Edition), available for purchase here.